The Scotch Pie Club Awards ceremony 2014 took place on the 15th January. The World Scotch Pie Champion was named as The Kandy Bar in Saltcoats! Many congratulations to them. The overall winners of each category are below, congratulations to them all. What is good to see is that pies won all the categories where they were up against other savoury products. It seems the real winner here is pie! Do also have a look at our thoughts on the winning Steak Pie by Brownings. 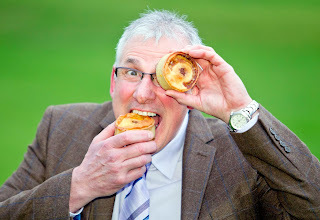 We were also pleased to see that JB Christie, the 2013 World Scotch Pie Champion, were 2nd runner up in the Scotch Pie Category, recognising a pie which we thought was fantastic. The Pierateers were represented on the Scotch Pie Club Awards judging panel. See below for the review of the day. There are many pie contests around the world but perhaps none more prestigious than the Scotch Pie Club Awards. Running since 2000 it has a much longer heritage than the rival British Pie Awards south of the border. The Scotch Pie has a cult following with feeling running high amongst the Scotch Pie community as to where the best Scotch Pies can be found. The Scotch Pie Club is the body which runs the eponymous awards. They know the big difference that winning the awards can make to a business and consequently take it very seriously. 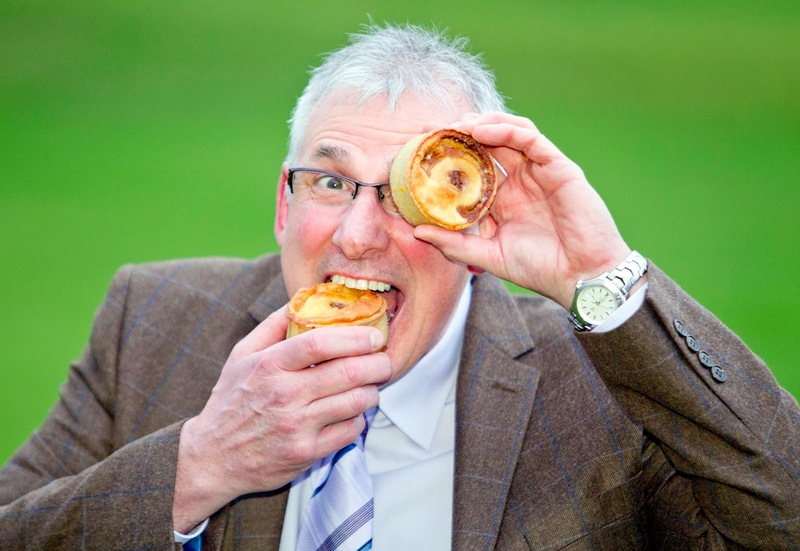 This year Pierate was pleased to be able to send our very own Pierateer SJL to be an official judge at the Scotch Pie Awards 2014. It was very exciting to take our pie reviewing beyond our own website and gave us a unique opportunity to provide an insiders perspective on what the Scotch Pie Club Awards are really like. The awards recognise the best Scotch Pie as the 'World Scotch Pie Champion' which is amusing, I am not sure whether there are any entries from outside of Scotland but there doesn't seem to be a rule against it. But that aside, it is fair to say that you would expect the best such pie to come from the Scotch Pie motherland anyway. The awards don't just stop at Scotch Pies though! There are 9 other categories with the best in each class receiving the 'Diamond & Overall Winner' award. There are then Gold, Silver & Bronze awards up to a total of 5 of each, depending on the number of entries to that category. Again somewhat confusingly, the winners of all the Hot savoury, cold savoury, steak pie, vegetarian savoury and fish categories all compete for the winner of best overall 'Speciality Savoury' judged separately by the head judge. Looking at all the names of the categories you might be concerned that there would be a lack of pies! Fortunately the majority of the savoury products except the sausage rolls and bridies were pie entries. SJL was very pleased to be assigned to judge the steak pie category. Our pie rankings have steak pies in the top two places and they are always a favourite on the Pierate Ship. At 11:30 there was a briefing from head judge Robert Ross. The teams split up and it then took a couple of hours for the initial judging. The Steak Pie category had 54 entries with four judges and a team leader. The judges split into two pairs and took 27 pies each. The judging form was completed for each pie. This was quite different to the usual seven Cs that the Pierateers normally use. The following criteria were judged; 'Internal Appearance' (shape, colour, boil out), 'External Appearance' (Bake, colour, texture) and 'Taste & Smell' (smell, texture, taste, balance of flavour). It was good that the 'Taste & Smell' was weighted higher than appearance as this is what is really important. In general the scoring system seemed fair, although it was noted amongst our group of judges that there should be a criteria for the filling to pastry ratio (which is incidentally something we love to talk about here on the Pierate Ship ;-) ). The rules were closely followed, this stipulated that each pair of judges would forward their top ten pies for final judging by all the category judges and the team leader. This part of the system was great as it ensured consistency between the different groups of judges. It did however mean that these pies had to be tried again! This brought the different pies eaten by SJL up to a total of 37 with many of the pies being tried twice. At this point the pie judging went a bit free style with the pies being compared against each other and lined up in order of preference. This didn't necessarily follow the original scoring, one of the key questions being asked was does it look like a pie which can be crowned a winner? This was particularly the case for the overall winner which was one of the best looking pies. A very good tasting pie unfortunately just missed out on winning because excessive boil out meant it didn't quite look the part. There were some very good pies and it was a difficult decision. It will be very interesting to find out who actually made the best pies (the identities were secret from the judges) when winners are announced in January. Winning Steak Pie! It looked amazing. Once it was over it was good to see that waste was minimised. Everyone was allowed to take any spare pies they wanted and I heard that some would be sent to a homeless charity. (There was quite a bit of spare pie as four were submitted to allow for repeat judging). My overall impression from the event was extremely positive. It was well organised and I don't think it could have been judged in a much fairer way. It was a lot harder work than I had expected, despite only trying a small piece of each pie I still ate a lot. I think this was the first point in my life where I really didn't want to eat any more pie. The event was quite long and I was surprisingly tired when I left around 16:00. It was worth it as I really enjoyed the experience. I didn't find it a problem being new to this type of pie judging. Everyone was extremely friendly and helped me fit in (despite being an English lad). The highlight for me was being called 'pie man' by the head judge Robert Ross. 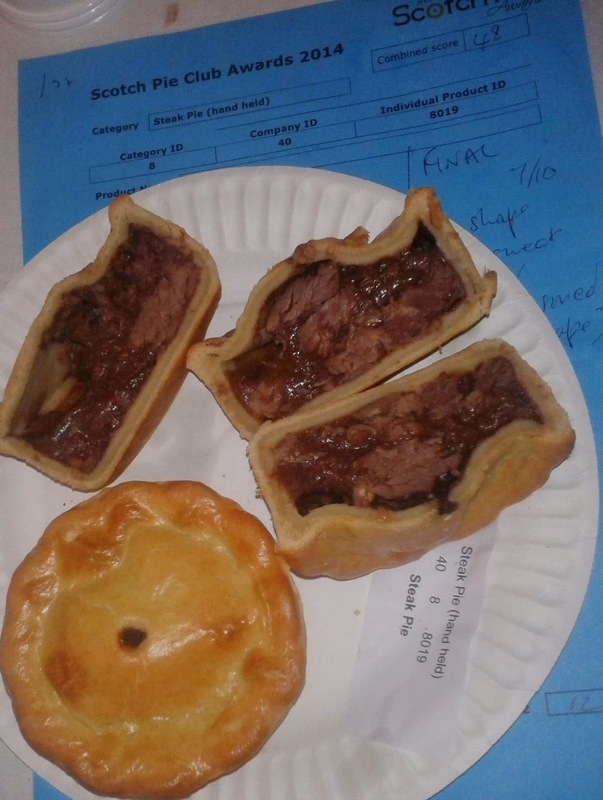 Some people did mention to me that it was nice to have a 'pie eater' as a judge because most of the judges were 'pie makers' from the Scottish butchery and baking industries. A fellow judge admitted he wasn't actually much of a pie eater himself. So hopefully our attendance did help the competition reach their target audience who will after all be the 'pie eaters' of this world! With over 250 pie reviews online there is no doubt that The Pierateers are 'pie eaters'. Many thanks to the Scottish Bakers traders association (who run the event) for letting us get involved. See more photos from the event here. On the Pierate ship we also have our own version of the search to find the best Scotch pie including a review of the 2013 World Scotch Pie Champion. Please send us any recommendations of pies we should try! Buy a Killie pie random oot one of the shop's It has about 4 bit's of dried out steak n grizzle n gravy, there pie's are mingin, they just look like that for the comp! end of.